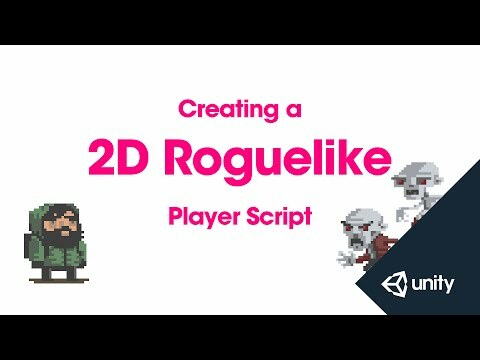 This is part 9 of 14 of the 2D Roguelike tutorial in which we write the Player script which will take input and control the player's movement. that our player script is going to make use of. Let's open the game manager in Monodevelop. and initialise that to 100.
which we're going to initialise to true. public it won't be displayed in the editor. in which we're going to disable the game manager. and we'll call this one Player. We'll open it in Monodevelop. previously instead of from the default monobehaviour. called wallDamage and set it to 1.
wall objects when it chops them. integers called pointsPerFood and pointsPerSoda. a food or soda pickup on the board. restartLevelDelay and initialise it to 1.
the type animator called Animator. game manager as we change levels. and override keywords to our start function. than we have in the moving object class. to our animator component using getComponent. of playerFoodPoints, which is stored in the game manager. in the game manager as we change levels. that returns void called checkIfGameOver. CheckIfGameOver is going to be simple. and it's going to return void. for X direction and Y direction. that we're going to subtract 1 from the players food total. which is one of the core mechanics of the game. of our base class moving object. of the line cast done in move. to check if the game has ended. to say that the player's turn has ended. using the boolean that we created in the game manager. follow will not be executed. called horizontal and vertical and set them to 0.
along the horizontal and vertical axis. and store it in our horizontal variable that we declared. We're going to do the same thing for the vertical axis. controller input for a standalone build of our game. we're going to call our AttemptMove function. encounter a wall, which is an object that it can interact with. we gave the AttemptMove function the generic parameter T.
interacting with when we call the function. expect to be interacting with a player. that the player is going to attempt to move in. abstract function without any implementation. and are blocked by it. while casting it to a wall. of the wall that we hit. player is going to do to the wall. of our animator component that we stored a reference to earlier. the parameter that we want to set as a string. meaning that we're going to the next level. parsing in the parameter Application.LoadedLevel. which is the only scene in the game. we would load another scene. which takes an integer parameter called loss. LoseFood is called when an enemy attacks the player. is set the playerHit trigger in our animator. from the player's food total. we want to see if the game has ended. namely the exit, soda and food objects. which is part of the Unity API. to see first if it's tagged Exit. and then we're going to restart the level. enabled for the player to equal false. tag is equal to food. but for now let's save and return to the editor. and add the Player component that we just created. and so that looks good. interactive functionality in place for our game. to add UI elements, audio and our mobile controls. the animation controllers for our enemies. Please note that this lesson has been updated to reflect changes to Unity's API. Please refer to the upgrade guide PDF found in your asset package download or available directly here.